A repeat for lunch today, with a few enhancements. Looks just like Saturday, doesn’t it? Except I kicked it up a bit. Made my own dressing. Jam jar dressing using locally produced items. Two tsp. of raspberry jelly. Two tbsp. plain yogurt. Splash of white balsamic vinegar. Two tbsp. olive oil. Salt and pepper to taste. A pinch of demerara sugar. I used the Secolari brand oil and vinegar today. 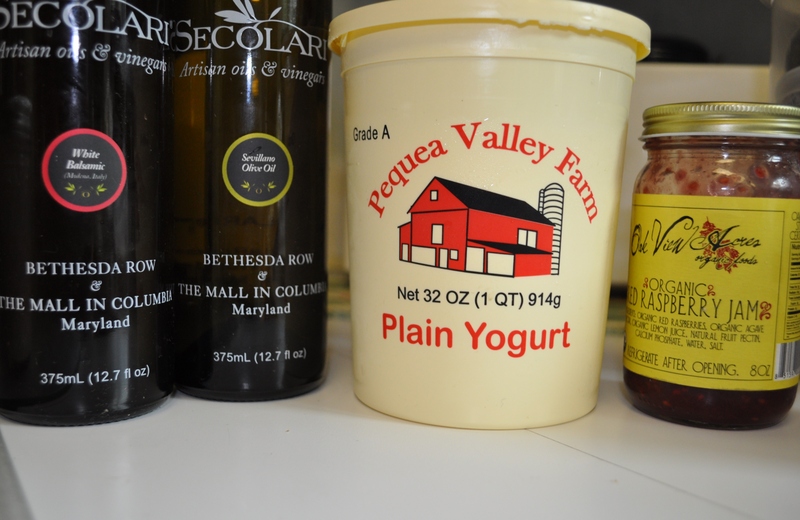 They are a family owned business located in Columbia Mall, and their original store in Bethesda. This is “local” olive oil, so to speak. Only two states I know grow olives to make olive oil. California and Texas. This oil is from California. The salad was made with the Baywater Greens Salisbury MD leaf lettuce. The raw milk gouda from PA. Chiogga and red beets from the Amish farms. Blackberries from Agriberry. Blueberries from PA. Walnuts not local. Bought in bulk at Wegmans. Eating locally for lunch today, and again for dinner. I slow cooked some Wayne Nell pork. Made pulled pork sandwiches before heading out to Iron Bridge for a tasting. Served with a side of roasted vegetables from my garden. Last night we went to Bistro Blanc for a “bottle Share” night. Had a few local items in that meal, too. They buy their beef locally and we had a very nice Angus tartare. And we took a local wine. Brunch yesterday was an omelet with Miller Farm eggs. My tomatoes. My onions and shallots and leeks. Breakfast today included those lovely berries with cereal. I am doing well on the Buy Local Challenge. 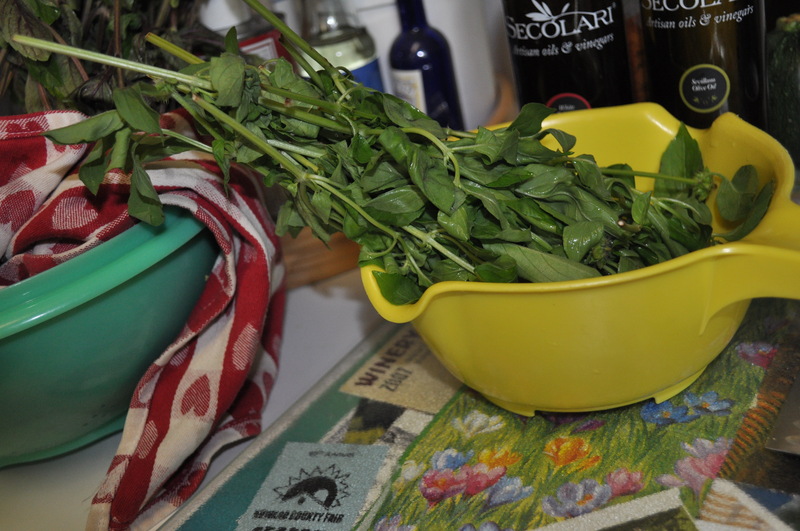 Tomorrow I am making pesto with my basil. Some of it will make it into dinner, that’s for sure. Three days down. Six to go. Posted in Farms, Food, Gardening, Locavore and tagged buy local challenge, cooking, farms, Food, foodie, gardening, Locavore. Bookmark the permalink. I cut my CSA beets this morning and discovered that they have candy-cane-like stripes inside. Quick consult with google revealed that they are Chiogga beets. And I had thought this week’s CSA pick-up didn’t include any surprising produce! Next surprise was finding that your new blog post relates to beets, including Chioggas! Chiogga’s are really pretty little things in a salad. People almost don’t know they are beets if we get the little ones. 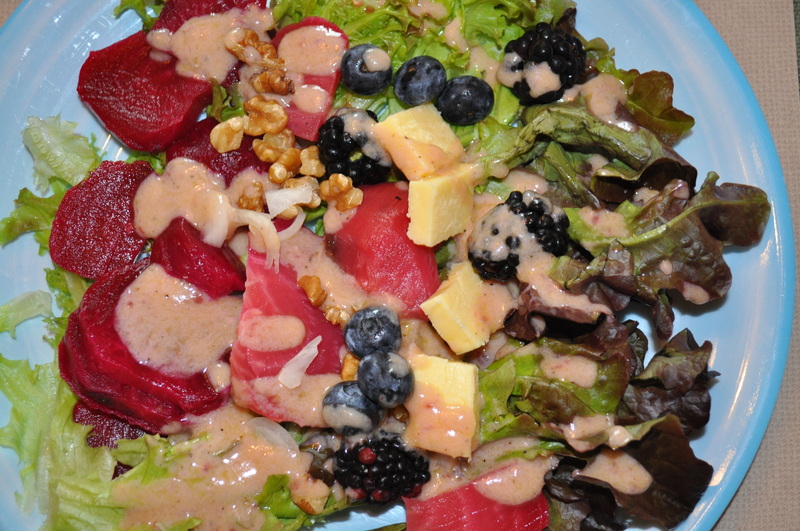 I love dry roasted beets, that have been chilled, in a salad with cheese and nuts.